This past summer, King County Metro Transit underwent a peer review by a panel of transit agency leaders from around the country. “Fixed route services” is the industry lingo for regular bus and train routes. Cities whose main transit agency allows paratransit-qualified riders to ride the fixed routes for free include Los Angeles, Chicago, Dallas, Miami, Atlanta, Washington, Boston, Cleveland, Indianapolis, Denver, Salt Lake City, El Paso, and Las Vegas. Numerous smaller agencies offer the same deal, including Whatcom Transit Authority (Bellingham). In some cases, like Atlanta, the rider has to go through a separate qualification process to determine whether it is safe for her/him to ride the fixed routes at all. A little discussion about personal care attendants is in order, since paratransit riders are paratransit riders because they are unable to ride the fixed routes (or at least some of the fixed routes, some of the time) independently. Personal care attendants ride paratransit for free when accompanying a paratransit-qualified rider, but can be charged a fare on fixed routes, even when accompanying that same passenger. Companions other than a PCA can be charged fare on either service. The Federal Transit Administration has FAQ pages that cover these topics. Comments about paratransit and fare structure are encouraged, but comments about the government giving out free stuff or discounts in general will be deemed off-topic. On the flip side, encouraging paratransit riders to use fixed routes (which in our city means buses) leads to more use of ramps, more shuffling people around to get at the ADA seats, more driver time spent un/buckling wheelchairs… over time, does the lost time amount to a wash? Encouraging use of a level-boarding system like Link over paratransit seems like a no-brainer. But Metro is already susceptible to so many operational delays. I had the same concerns until I read the TCRP report. The magnitude of potential savings overwhelms the extra minute or two here and there from dealing with securing mobility aids (with the possible exception of rush hour downtown, but that could be a stated exception). I haven’t seen a wheelchair loading take more than a minute in a long time. If Metro were to offer restraint-free slots (which, I believe, are currently only offered on RapidRide) on more buses, that would mitigate the slow-down, as well as give riders more independence. Consider that many Access riders don’t have mobility aids. That includes most deaf/blind riders, riders with a mental disability (which, to the credit of the state of Washington, is given equal consideration to physical disabilities), and other vulnerable riders. For many, all that may be standing between them and riding the bus or train may be a trustworthy companion, allowed to ride with them for free. This isn’t just about money. This is about allowing people with various disabilities to live like the rest of us. Well put. Most people who ride access type services are doing so out of need rather than out of choice & I think that gets lost in the conversation at times. Having said that – if a disabled person DOES HAVE access to fixed route transit service , they should use it to the maximum degree possible with the knowledge that access services will be there for them if they need it as a backup. I can speak to this from two separate angles – as a person who is visually challenged, I’ve been using transit since my teens & I go all over the NYC area. As a result, I have been the go to person on how to get around. Also a childhood friend of mine is in a program for those who have nurulogical disabilities & as part of her needs, the state picks up most of but not all of her transportation costs. She schedules pick up times similar to the way most access systems work & gets build monthly for a portion of those costs. I should also note that several members of this agency do ride the local bus system in adition to using the transportation that is provided. NYC’s not giving free fixed-route service to paratransit riders stuck out like a sore thumb during my research for this post. Perhaps nobody really cares about that aspect there, or it is of marginal relevance. I’m just curious. But I’m also curious about NYC’s taxi-as-complementary-paratransit program. We have a taxi scrip program here, for which I haven’t delved into the details. I’d love to hear more of your thoughts on cutting-edge best practices in the paratransit industry! I understand that, but practically speaking we have a large network to operate here. As an flextime Route 40 commuter, if the bus has encountered delays upstream we can wind up loading and unloading wheelchairs four or five times between Ballard and South Lake Union. Hot spots are 24th Ave/56th St, Market St/Ballard Ave, the Food Bank on Leary, and 1st Ave/N 36 St. This destroys reliability on the line, specially when operating with high-floor coaches, which Route 40 was doing as recently as 2 weeks ago, and might still be doing today. Level boarding, passive restraints, and actual room for passengers to move about in the vehicle are all improvements that make it possible to deliver reliable service and reduce or eliminate the disparity in service afforded to those who currently use paratransit. But we don’t have (all of) those yet. Medium-term solutions for reliability (mostly stand-by buses/operators, I believe), are part of the Seattle Transit Proposition 1 package. No, this won’t save a trip that passes by the food bank at the wrong time of day from being delayed, but it can get future trips back on schedule. The cost of one saved paratransit trip can pay for an operator to be on stand-by for an hour. I’m not aware of NYC’s Access-a-Ride system or policies as I reside in Westchester. What I do know is that the MTA has experimented with taxies as a lower cost alternative, but I don’t know where that stands since the TLC has bawked at the requirement of purchasing accessible taxies. The cost of providing Access-A-Ride services are astronomical & are crippling the MTA’s finances. To cut down on costs , vans were possible will drop off passengers at the nearest accessible subway station unless the elevators aren’t working or there’s no other way to go. Also in both NYC & Westchester the requirements to receive access services have become more stringent in recent years. As a result, you’re seeing more wheelchair passengers using the fixed route busses. If a bus is more than ten minutes late where I live there is a chance it is do to either a wheelchair or bad traffic. http://www.secondavenuesagas.com is a site similar to this one with stories of all sorts on transit issues around NYC & elseware. An absolute regular must read. Many of the issues covered are no different than what you face there in Seattle. Infact I wouldn’t be here if it wasn’t for SAS. Kyle, high-floor coaches are gone from Central Base (which operates Route 40) as of the new shakeup. Did those buses get moved to suburban routes, where lift use causes less havoc, or were they all retired? As a result of the shakeup East/Bellevue’s peak bus requirements went down considerably. So East Base sent a bunch of Orions back to Central Base, and Central Base sent Bellevue a few Gilligs in return, but not enough to make up the difference. A number of Gilligs from both Bellevue and Central were also retired. Within the city, we still have plenty of high-floor artics running on Ryerson and North Base routes: 9, 11, 16, 24/124, 26/28/131/132, 27/33, 31/32/65/75, 66/67/68. Those won’t be replaced until 2016 when a giant new 60′ hybrid order will start showing up. Brent: NYC governments are notoriously awful when it comes to attitude towards disabled people. This is the city which had to be sued multiple times because they were trying to require taxi drivers to buy non-accessible taxis. NYC Transit has been sued repeatedly for ADA violations for rebuilding subway stations in $200-million-plus projects without adding elevators — which is a really blatant violation. It shouldn’t be surprising that NYC is an example of “worst practices” when it comes to paratransit — and it is. I can think of several other ways in which it’s unusually terrible. If you want to know about ‘best practices’ for providing services to disabled people, look at London (UK) — probably some of what they do there couldn’t be mandated in the US, though. Chicago and Boston have also shown some leadership in recent years. I know Metro is going toward level boarding (yay! ), but are new buses passive-restraint? This is important not only for independence and speeding up trips, but I could imagine it reducing Access use. It can’t feel good to slow down a bus to load you. Removing that issue will make those in wheelchairs feel more like regular passengers, and I could imagine that increasing regular bus trips. I don’t know Metro’s plans for passive restraint, but consider the utility of bike racks. When they were put on random buses, they were useless. When they became universal, bike riders finally started using them in large numbers. As a secondary effect, having multiple slots on all buses may have an effect similar to having triumvarate racks universally. If Metro is holding itself back from converting the rest of the fleet because of low usage on RapidRide, it should think of passive-restraint slots like bike racks. The end of lifts can’t come soon enough, and then I think there will be a bump in wheelchair and scooter ridership. I’m not sure how well passive-restraint does for the various brands of scooters, or if the brakes work on all brands of wheelchairs to make passive-restraint truly safe. “Passive restraint” is certainly safe on all manual wheelchairs. Not sure about electric wheelchairs which are very different. Does anyone know how much Metro spends on Access service and fixed route service? Isn’t fixed route around $500 million a year? I think I read somewhere that fixed routes takes up 77% of some operating subfund and Access is 10%. I think I read otherwise, so I’d also like to see any actual figures. Metro has an index page on performance reports. The 2012 Annual Management Report will hopefully answer your questions, albeit for two years ago. The paratransit capital expenditures came to $4,871,185. Paratransit operating expenditures came to $58,094,753. Overall capital sub-fund expenditures came to $182,800,221. Overall operating sub-fund expenditures came to $629,768,659. That makes paratransit roughly 7.8% of total transit expenditures. This means that when they cut back their regular transit service in order to save money, they wound up blowing their budget out of the water because of the sheer number of riders that wound up having to use the paratransit service rather than a regular route. The 40% increase in paratransit use wound up causing yet further cutbacks in regular routes. Therefore, having paratransit users use regular routes as much as possible saves money, and preserves services, in the end. It’s worth explaining one detail of the law here. Paratransit has to be provided for people who live *along or near transit routes*. This is because the ADA is an anti-discrimination law: if nobody in Duvall has bus service, then it isn’t discrimination to provide no bus service for disabled people either. … but if you cut all routes to an area *entirely*, your paratransit costs go down. Remember that when you think about the costs of routes such as the 224 to Duvall or the 208 to North Bend, or the 168 to Covington and Four Corners or the 907 to Enumclaw. They’re already expensive and poorly patronized routes — but on top of that, they cost a *fortune* in paratransit. Has any of the discussion included people who ride these services, especially those for whom the decision is a choice, rather than a necessity? 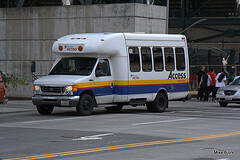 Operating paratransit service on a small level years ago, I hope just about everything has been improved. Standard in those days was very long delays, in addition to having to arrange trips a day in advance. Worst of all were the vehicles themselves- which from the picture look exactly the same now as then. I’m sorry, but a truck with some windows and seats in the bed is not a passenger vehicle. For the driver, worst thing of all is the terrible range of vision from the driver’s seat. Federal law should forbid junk like this being imposed on either drivers of passengers. If this is the best dial-a-ride can offer, transit should definitely either make arrangements with cab companies or Uber- or add its own taxi service to fixed route. After whatever changes the law needs. Wheelchair securement from Rapid-Ride- and Swift, and also Eugene Oregon coaches should be standard on Tunnel buses-where I wish average rush hour boarding was quick and easy. Really, Rapid Ride order could be expanded so whole buses of that style could do Tunnel work as well- they’re the buses that should have become the whole DSTT fleet when hybrids come in. For third door if nothing else. Also for DSTT, real security, is best served by re-purposing the whole Securitas crew to be station agents- or better yet, do that under Metro employment. And for police work, use police. Wheelchair loading, information, and all services needed to let drivers concentrate on the work their title describes- same as happens, and works, on LINK. DSTT’s real need- and security’s as well. Do you have any reasons not to let paratransit riders ride the fixed routes for free, when they can do so safely? Do any safety reasons come to mind? Absolutely no problem at all. But again, at the beginning,at least, I would ask as many of these passengers as possible why they prefer special services now. As a pretty steady passenger-by-choice, at age 69 I absolutely refuse to allow, let alone compel, anybody younger to give me their seat. Sadly, my purpose is often defeated by stubbornly insistent younger people. But I keep trying. Seriously, for some years now, I’ve been having an ever harder time waiting for the bus outdoors. I make it a point to know the system well enough to arrange my trips to spend waiting time someplace warm and comfortable- and equipped with bathrooms. Which last is MAX! importance to the ridership we’re discussing. Meaning two hour express ride on the 592 without intercity toilets on buses makes service with Tacoma stop mandatory. Of of sked allows, convenient transfer to LINK. Word to the unwise who left out public toilets at Lakewood Station- hope your duties come to include cleaning the wall behind the station. Doubt any jury would convict for public nuisance. Some advice and training for comfortable travel would help- as would showing our own information system how not to leave helpless people on a freezing howling-wilderness top to transfer on half-hour headway route! In other words, for our fixed route system, its inability to keep schedule due to traffic is probably main killer here. So reserved lanes and signal pre-empt are nowhere near [OT] about why people choose what. One reason I’m pushing for fastest possible service between Olympia and Seattle, bus or rail, is that while the ST 592 does serve both places, the ride still takes two hours to go 60 miles I-5. Mainly one I-5. Why do my posts get diverted into talking about the lack of public restrooms at transit stations? This would work if your city & county governments had passed regulations to cause the taxi fleet to become all-accessible. Since they haven’t, it doesn’t work yet. In London, the taxi fleet has been 100%-accessible since the early 1990s. The Metro paratransit fare is lower than the fixed-route fare? People respond to incentives! For a paratransit-eligible customer who isn’t as concerned as much about time as they are price, they are encouraged by the pricing structure to take paratransit instead of a fixed-route service. At a minimum, the paratransit fare should be equivalent to the fare a fixed-route customer would pay for the same trip to equalize the costs to the customer. As an upper bound, Federal regulations allow agencies to charge up to twice the adult one-way fare. Off peak, Metro could charge up to $4.50, peak fares would be $5 and $6 for one and two zones, respectively. Perhaps twice the adult one-way fare is too high, but a paratransit fare below the fixed-route fare is definitely too low. Paratransit-qualified riders who ride the fixed routes pay the RRFP fare to ride those routes, which is less than half the regular fare. There is an argument among lawyers about the ceiling on paratransit fares in Washington State. I won’t go against the lawyers, some of whom say the ceiling is the regular peak fare, not twice that fare. Just raising the paratransit fare to $2.75 would be a political challenge, but it would bring the fare much closer to the industry norm. Doubling it would leave it well beyond the industry norm, due to our high regular fares. Doesn’t the idea of directing folks with personal mobility issues towards fixed routes actually clash with the generally praised strategy of reducing bus stops? An extra two or three blocks might only be a regular inconvenience for a younger, able-bodied bus rider. But it might be an actual problem for someone in a wheelchair. Or even a hazard, unless the corresponding streets and crosswalks are all fixed. At the very least, this sorta reminds me of elevators and escalators that seem to be almost permanently closed for repairs in sprawling underground tunnel stations…It’s not exactly a “welcome” sign for the people who really need them. We’re certainly not adding five minutes to every route by having the bus stop every two blocks, on the extreme off chance somebody with a mobility issue will be riding that day, and needed one of the stops that would have otherwise not existed. But, adding a single stop to accommodate someone who has a demonstrated need for that stop would be a possibility. Don’t get me started on all the sidewalk money we waste building non-ADA-compliant purple pebble meandering paths that are designed to beautify a street rather than making it easier to travel along, while a lot of outer neighborhoods are on a hundred-year waiting list to get sidewalks (and, thanks to a couple people complaining about not enough sidewalk money in a previous bond issue that they helped defeat, that waiting list isn’t getting any shorter). Still, curb cuts seem to be most everywhere. And again, many of the beneficiaries of the free ride would be riders whose only mobility need is a companion (which could be as simple as a service animal). Probably roughly 3/4 of paratransit riders will still not be able to avail themselves of the free-ride offer. That’s not a reason to deny it to the 1/4 fhat can sometimes ride the fixed routes safely. If 1/4 of Access trips got diverted to fixed routes, that could save Metro ca. $15 million per year. When roads are devoted mostly to automobiles (as they are), sidewalks are a fundamental access issue. They are more important to public transit than buses or trains or bike lanes. And yes, they’re vital for disabled access, too. The current system for carrying disabled passengers is a fundamentally broken model, where each trip costs taxpayers an insane amount of money, while still providing horrible levels of service to the people who actually depend on it. Yes, the ride is door-to-door, but it is not unusual for people to wait an hour or more for a paratransit van to show up, or schedule a trip to arrive at the doctor’s office at 9:00 for an 11:00 appointment. I would rather see a system where disabled people could simply be reimbursed for door-to-door transportation expenditures provided by the private sector (up to some limit, of course), which they could spend on whatever service best meets their needs, provided the trip serves some kind of “approved” purpose. (In some areas, it might also be necessary for taxpayers to subsidize the operating costs of wheelchair-accessible taxicabs in markets that are too small to sustain such services on their own). Ideally, the extra costs of mobility associated with being disabled should be paid for by an entity responsible for the mobility of the disabled, which would be completely separate from Metro. One could even imagine a world where private health insurers would be the funding source, and disability transportation would be one more service that you could make a claim for, in exchange for a few extra dollars a month in premiums while you’re young, healthy, and don’t need the service. One piece of disabled mobility that taxpayers should fund, however, is decent sidewalks that are maintained well enough so one can actually get around on a wheelchair without constantly getting stuck. This should be easy to sell, as it benefits not only the disabled, but anybody traveling on any kind of human-powered, wheeled apparatus, which could include walkers, bikes, strollers, shopping carts, or anything in between. Unfortunately that’s not the way the law is written. The law and regs specifically call for transit authorities to provide paratransit service and/or deviated fixed-route to satisfy their duties under the ADA. You’d have to rewrite the law to change the way these trips are delivered and the chances of that (at present) are zero and… uhh… zero. Frankly, places which have a good system of 100% accessible taxis find that their paratransit demands drop *massively*, because most of the people who were using paratransit prefer taxis if they can afford them. A good system of 100% accessible taxis is not what you have in Seattle, and it’ll take years to get such a system. By all accounts your taxis frequently provide awful service and are rarely accessible anyway. I suggest you start working on that now. I’ve found reading the “inland railway news” is really helping grow my rail sector understanding.